I have been a therapist for more than 15 years and I have come to realize that most people have experienced trauma. The misconception assumes trauma equates to PTSD. This is not true. Not everyone that has experienced a trauma will have a diagnosis of Post-Traumatic Stress Disorder (PTSD). In fact, some will have few symptoms at all. In reality, trauma is defined as “a deeply distressing or disturbing event”. Think back throughout your life. Was there ever a time you have experienced something deeply distressing or disturbing? A car accident? The death of a family member? Being bullied in school? These events can change the way we perceive the world. They change the way we act and react to others. The events in our life can cause many adverse reactions – depression, anxiety, poor focus, relationship problems, and yes, even PTSD. Once I explain this to people you can almost see the weight lift off their shoulders. It reminds me of a former client, Cameron (named changed to protect her privacy). She was struggling with intimate relationships. She found herself isolating from others and was often very angry/easily irritated. She would often avoid social situations altogether. I recommended EMDR therapy. At first, she was reluctant but I provided her some basic information to get started. EMDR is short for Eye Movement Desensitization and Reprocessing. The theory behind EMDR believes successfully processed memories are stored in the memory system. These are integrated with other memories that are similar to these experiences. When we experience a situation that causes us to be highly emotional or causes a great deal of emotional distress, these memories can be inadequately processed and thus stored improperly. When we are faced with a similar situation again we are “triggered”. The brain associates to this maladaptively stored situation and we react in a way that is inappropriate or abnormal for the situation itself. For Cameron, it was yelling, crowds, loud noises, and arguing that often caused her to have a heightened startle response and intense anger reaction. 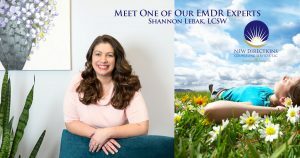 EMDR is a comprehensive form of therapy that uses bilateral stimulation (in combination with CBT, trauma informed therapy, talk therapy, etc) to address the physiological storage of memory and how it informs experience. To simplify, the memory is re-opened and processed effectively, removing the maladaptive response (e.g. intense anger or quick startle) that was initially created by the high level of emotional arousal. Cameron was still confused but also willing to try when she learned it was coupled with CBT and other forms of therapy. After many hours of training, consultation, and practice, I still find it hard to describe how this works in simple terms! 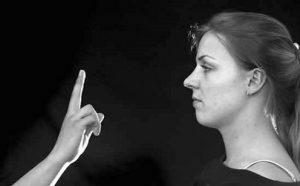 But after using EMDR, she was able to connect the sudden loss of her husband to the fear of intimacy. She was also able to overcome her fear of social situations by connecting this fear of crowds/loud noise to the fear she experienced as a child when her parents would fight/yell.